These words by Robert Edmond Jones from The Dramatic Imagination (1941) come to mind as I read Yi Lu’s Sea Summit, translated from the Chinese by Fiona Sze-Lorrain. Yi Lu is a theatre scenographer, and her poems brim with the imagistic tendencies we might expect from a visual artist. More specifically, her poetic style fits that of a theatrical set designer. Within the poetry of Sea Summit, the images are like set pieces. They play supporting roles as they help to tell the speaker’s stories. Here, at the end of the poem, these images more directly represent the plights and the triumphs of the speaker, as the treeful of bird calls functions as simile. The shift from me to an implied you, via the command “see a water drop penetrate a stone,” would be both jarring and inaccurate to the Chinese poem. This addition of I before “see a water drop penetrate a stone” allows for a truthful translation of the line. 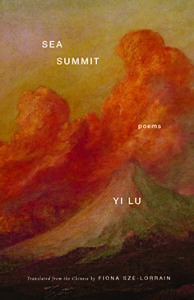 The lack of the poem’s punctuation (and you’ll find no punctuation in the Chinese nor the English version of Sea Summit), paired with the parallelism of the lines, allows the reader to understand that it is most literally the speaker who sees this “silent endurance of a mountain.” Moreover, Sze-Lorrain’s omission of the I in this final line demonstrates her expert understanding of the rich history of Chinese poetry. The subtle exclusion of that I from the closing line leaves the reader with that universal and immediate experience that Weinberger notes as a characteristic of Chinese poetry. This communal and visceral experience reminds me of the theatre. From cows whose “bowed heads seem unrelated to their tails” to the “exploding peak of the volcano’s heart,” from the “pregnant woman like a big flower” to pain as “the crossroad of heavy traffic / trucks cars motorcycles rickshaws bicycles / in a chaos blocked,” Yi Lu’s images are masterful in a way that, perhaps, only a theatre scenographer might envision. They reflect, support, and converse with the condition of the speaker. And, like curtains, these private experiences are torn open in a theater where there is no fourth wall; as we read, we’re immersed in each scene, each poem, via the stage that is Yi Lu’s sensitive and poignant poetry.